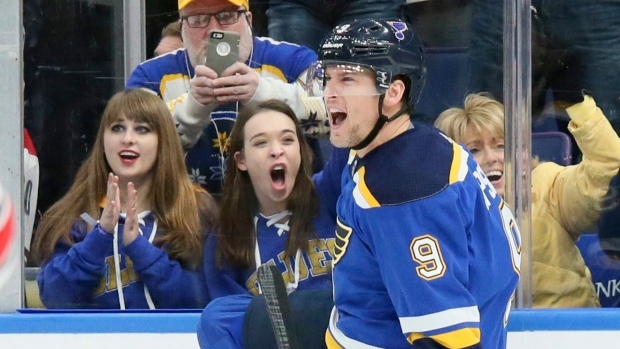 ST. LOUIS — Scottie Upshall fit in quite nicely when he was moved to the top line with Vladimir Tarasenko and Brayden Schenn at the start of the third period. Upshall broke a tie midway through the third and the St. Louis Blues held off the Carolina Hurricanes 3-2 on Saturday night. Upshall took a pass from Brayden Schenn and beat goalie Scott Darling between the legs for his sixth goal of the season and first in 11 games. "I yelled to (Schenn) and he made an incredible no-look pass that put me in a great shooting spot," Upshall said. "And I was able to put one in." Kyle Brodziak and Partrik Berglund also scored for St. Louis, and Carter Hutton made 23 saves. The Blues won for the third time in 10 games and snapped Carolina's four-game winning streak. Derek Ryan and Lucas Wallmark scored for Carolina. Darling stopped 26 shots in his first start since allowing eight goals in an 8-1 loss to Toronto on Dec. 19. "He definitely stepped up and made some big saves for us throughout the game," Ryan said. It's good to see him play well. He made some big saves for us and hopefully some confidence for him." St. Louis opened the scoring at 43 seconds of the first. From behind the net, Alexander Steen found a wide-open Brodziak for a one-timer past Darling. Brodziak has seven goals this season. "Anytime those guys get rewarded, they've been playing real well," Blues defenceman Jay Bouwmeester said about Upshall and Brodziak. "Both those guys do things that are kind of underappreciated." The Blues made it 2-0 42 seconds into the second period. Alex Pietrangelo and Berglund executed a 2-on-1 to perfection, with Berglund burying Pietrangelo's pass past Darling for his sixth of the season. Carolina cut it to 2-1 midway through the second on Ryan's ninth goal of the season. Ryan came out of the penalty box after a slashing penalty, catching the Blues off-guard. "I'm always thinking that when I come out of the box," Ryan said. "So if we get possession, and you don't see it very often but if that guys gets a break I'm definitely looking for that." Wallmark scored his first NHL goal with 6:02 left in the period. Recalled from Charlotte of the American Hockey League, Wallmark was playing his first NHL game of the season and ninth overall. "It's a big goal for me, and for the team there," Wallmark said. "So it's fun to see the puck get into the net." NOTES: Bouwmeester returned to the Blues' lineup after missing nine games with a lower-body injury. The Blues made a corresponding move sending D Jordan Schmaltz to San Antonio of the AHL. ... The Hurricanes, who committed two penalties, came into the game as the least penalized team in the NHL with 104 penalties. Hurricanes: Host Washington on Tuesday night.